There's no better way to experience the glorious history of the Kings of France, and the Chateaux of the Loire Valley, than making the Chateau your home, at least for a while! This jewel of a private Chateau is completely fenced in and surrounded by 60 acres of manicured grounds, fields, forest, a lake & 2 ponds and 2 ancient farmhouses. There are walking paths. Limited but available are bicycles (helmets ) and fishing gear for your use. The Chateau has been lovingly restored to its former glory, furnished with period pieces normally seen only in museums, but with all the modern amenities & features for a relaxing as well as stimulating stay. The attention to detail will transport you back to the elegance of 'La Vie de Châtelain' that the Kings of France came to the Loire Valley to enjoy. The Loire flows majestically through this castle-studded valley, listed as one of the UN World Heritage sites. When you're ready to venture further, just 25 minutes away by car or a delightful bike ride, is the Chateau Chambord, one of the most recognizable Chateaux because of its many turrets and Renaissance style. The Royal Town of Amboise might be next with King Francois I's Chateau perched on the hill, or maybe a visit to the darling of the Loire Chateaux, Chenonceau. We recommend several activities in and around the Chateau such as Food Market or Antique Tours, Winery visits & Wine Tasting. Live the dream and step back into France's Glorious Past while in Royal Residence at the spectacular Chateau . Expansive lake in rear grounds. View of pond with fountain in fore garden. Fenced in 60 acres property--mix of manicured grounds, fields, forest, 2 ponds & 1 lake and 2 ancient farmhouses. There are walking paths, Limited bicycles & helmets and fishing gear available. The chateau was absolutely fantastic! The chateau was even better than we could have expected! The rooms were amazing! The grounds were beautiful and the village was very intimate. If you want to visit the Loire valley and really explore the country side, then this is it! But the feeling is of living richly in the French past. The country kitchen is so warm! Try this Château: you will have a wonderful time. We just returned from our second weeklong visit to Le Charmois (our first was in 2013). It is an amazing country estate. The inside of the home is comfortable, roomy, beautifully decorated, and contains every convenience you need. 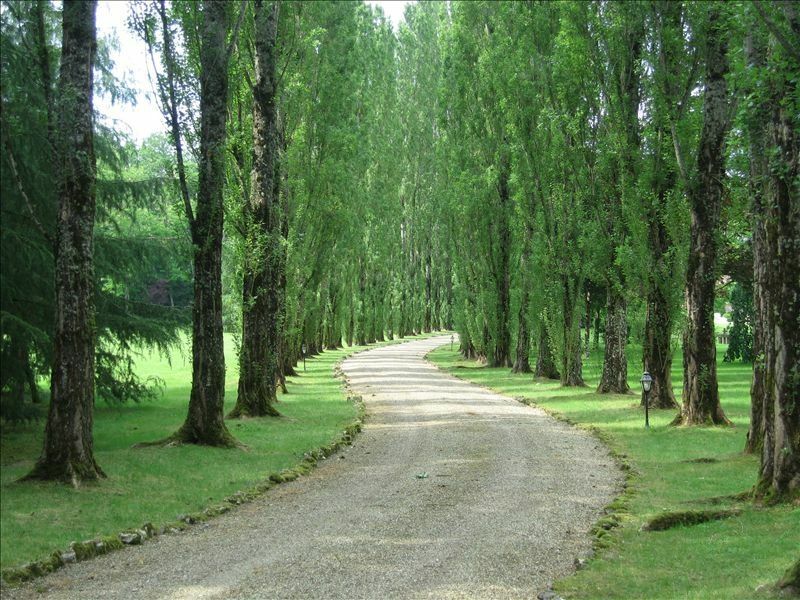 The outside is in a beautiful garden and forest setting that offers wonderful walks. The location is two hours from Charles de Gaulle, and serves as the perfect base for exploring the Loire valley. The best chateaus are easy drives - Chenonceaux, Chambord, Cheverny, Azay Le Rideau, Villandry, and Sully sur Loire are just some of the highlights. Same is true for some beautiful towns - Orleans, Bourges, Blois, Loches, Gien, and others. A number of wineries and other sites are also nearby. Le Charmois is itself next to the town of Chaumont Sur Tharonne, which is quiet and charming. If you decide against touring, and instead want to spend your stay enjoying the property, you will not be disappointed by the beautiful setting. But I imagine more people are likely to combine sightseeing with enjoying Le Charmois. The folks managing the property are outstanding and very helpful with whatever you will need. This includes the wonderful housekeeper, Catherine (who also cooks if you like), to the owners and other liaisons who offer remote support. All ages enjoy Le Charmois. We had grandparents, grandchildren, and the inbetween during our stays. Again, do not miss a chance to stay here! This was far above and beyond what can be described in words or pictures. The property was absolutely magnificent. My family of 5 spent a week in June and we will hopefully be back soon. Steven was most accomodating and everything was taken care of as requested. If you are considering this property I would strongly recommend you enjoy the gourmet cooking of the resident cook. Magnifique!! Words Can Not Describe!! !....but I will do my best. We (a group of long time friends) travel Europe frequently. One of our friends has a knack for finding beautiful Villas and Chateaus for each of our stays. Quite frankly, we make it a point to select a different one each time however, this one....will be the exception to our long running rule!!!! The Staff is beyond excellent!!!! Like no other! You feel at home from the time you step foot on the magnificent grounds. So welcoming. The attention to detail, accomodations, beautiful live orchids in every room, etc. are so much more than we ever anticipated. They absolutely think of EVERYTHING!!! The decor and furnishings are exquisite (fit for royalty) yet cozy and comfortable. Thoroughly impressed with the collection of music! I spent countless hours gazing at the inseperable swans in the lake and walking the grounds.The photos do not do justice. You must see for yourself! THANK YOU for sharing this treasure with us. I hope that all of the guests that visit respect and appreciate this rare gem. You must also treat yourself to a special gourmet meal prepared by Chef Damien. We can't wait to return!!! Our Christmas holiday at Chateau La Charmois was nothing short of spectacular! The chateau was stunning. It was large enough to comfortably accommodate our entire family, yet cozy enough for us to feel at home. The staff had placed a Christmas tree, poinsettias, and other decorations for us to enjoy. Each room was filled with beautiful antique and period furniture and draperies. We particularly enjoyed the player piano. It may have been out of tune, but it gave us an excuse for singing out of tune! Although the chateau is over a hundred years old, the amenities and modern conveniences made us feel like we were in a new four star hotel. As is usual when a big family gathers together, we spent most of our time sitting around the huge farmhouse table in the kitchen preparing our next meal and talking about what we would prepare the following day. For Christmas dinner the butcher shop in the village prepared two turkeys for us. And each morning one of us walked to the boulanger for fresh baguettes, croissants, and pain chocolat. What a treat! And we did try the tarte tartin. We were not disappointed. The winter weather kept us from spending too much time on the grounds, but a few of us ventured out in the cold and snow to explore. The grounds are pristine – a photographer’s dream. Every shot looks like a postcard. We ventured away from La Charmois to visit nearby Chambord, Blois, and Vouvray. The countryside was beautiful and the wines we tasted were good enough to bring home! We also visited Paris, which was less than two hours away. Spending Christmas at La Charmois was an unforgettable experience that we will always treasure. Thanks to the entire staff for making our French Christmas such a memorable one. Centrally Located in the Loire Valley for Chateaux hopping, shopping for antiques, attending open markets, winery visits & wine tasting. There's a Day Spa in the village offering massage and other well-being & beauty treatments, but,the property and living accommodations are so inspiring & beautiful, you won't want to leave! Payment Terms: I require my guests to make two payments: 50% due at booking and then 50% 60 days prior to check-in.